The pharmaceutical industry is a highly regulated industry with federal laws impacting it dating back as far as the Pure Food and Drug Act of 1906 to the Kefauver-Harris Amendment of 1962 to various effects from the Patient Protection and Affordable Care Act of 2010, and many laws in between. Despite being a highly regulated industry already, according a recent (2010) Harris Poll, 10% of Americans would like to see an increase in regulation on pharma and drug companies. With that in mind, there are sure to be additional regulations placed on the industry in the future. 7.1 What is a drug recall? To get started with, there is some terminology that should be defined. National Institute for Occupational Safety and Health (NIOSH) - NIOSH is part of the Centers for Disease Control and Prevention (CDC) within the U.S. Department of Health and Human Services (HHS). NIOSH is responsible for conducting research and making recommendations for the prevention of work-related injury and illness. Of particular interest to pharmacy is their role in establishing a list of Hazardous Drugs (HDs). new drugs that mimic existing HDs in structure or toxicity. Occupational Safety and Health Administration (OSHA) - OSHA is a government agency within the United States Department of Labor responsible for maintaining safe and healthy work environments. Material Safety Data Sheet (MSDS) - OSHA-required notices on hazardous substances which provide information on potential hazards associated with a particular material or product, safe handling procedures, proper clean-up, and first aid information. personal protective equipment (PPE) - Personal protective equipment is worn by an individual to provide both protection to the wearer from the environment or specific items they are manipulating, and to prevent exposing the environment or the items being manipulated directly to the wearer of the PPE. 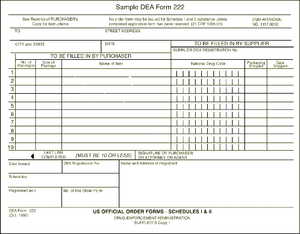 Drug Enforcement Administration (DEA) - The Drug Enforcement Administration (DEA) is a United States Department of Justice law enforcement agency, a federal police service tasked with enforcing the Controlled Substances Act of 1970.
controlled substances - Controlled substances are medications with restrictions due to abuse potential. There are 5 schedules of controlled substances with various prescribing guidelines based on abuse potential, counter balanced by potential medicinal benefit as determined by the Drug Enforcement Administration and individual state legislative branches. Risk Evaluation and Mitigation Strategy (REMS) - The Food and Drug Administration may require risk evaluation and mitigation strategies (REMS) on medications, if necessary, to minimize the risks associated with some drugs. REMS may require a medication guide, a communications plan, elements to assure safe use, an implementation plan, and a timetable for submission of assessments. United States Pharmacopeia (USP) - The United States Pharmacopeia (USP) is the official pharmacopeia of the United States, and is published dually with the National Formulary as the USP-NF. 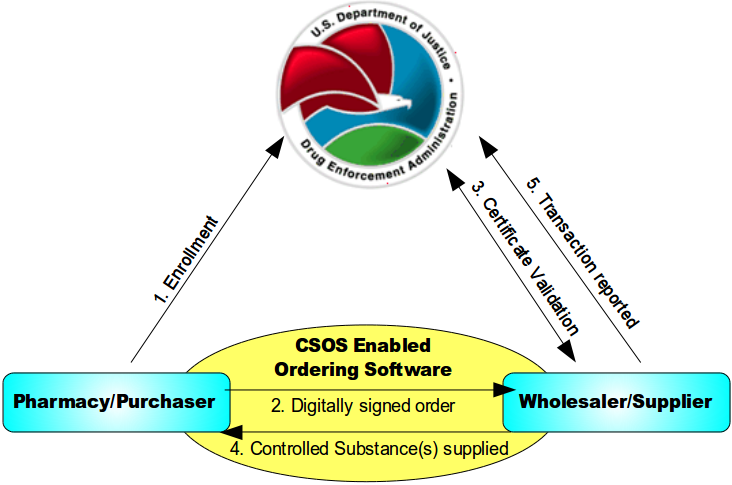 Prescriptions and over-the-counter medicines, and other healthcare products sold in the United States, are required to follow the standards in the USP-NF. The USP also sets standards for food ingredients and dietary supplements. Chapters in the USP that are listed as below 1000 are considered enforceable, while chapters enumerated as 1000 or greater are considered guidelines. Therefore, USP 797 and USP 795 are considered enforceable, while USP 1160 and USP 1176 are simply considered guidelines for best practices. compounded sterile preparations (CSP) - Compounded sterile preparations are admixtures that need to be assembled under aseptic conditions to prevent contamination. There is a vast array of information to be aware of with safety requirements posed by various organizations. Of particular concern is the safe storage, handling, managing accidental exposure, and disposal of hazardous materials. Hazardous drugs are drugs that are known to cause genotoxicity, which is the ability to cause a change or mutation in genetic material; carcinogenicity, which is the ability to cause cancer in animal models, humans or both; teratogenicity, which is the ability to cause defects on fetal development or fetal malformation; and lastly, hazardous drugs are known to have the potential to cause fertility impairment, which is a major concern for most clinicians. These drugs can be classified as antineoplastics, cytotoxic agents, biologic agents, antiviral agents, and immunosuppressive agents. This is why safe handling of hazardous drugs is crucial. The safety requirements include everything from the proper inventory rotation to avoid dispensing expired products, to material safety data sheets to provide the necessary information for safe clean up after accidental spills, to appropriate handling of oncology materials, and proper storage of chemicals and flammable items. Proper rotation of inventory and periodic checking of expirations help to reduce the potential for dispensing expired medications. It also maximizes the utilization of inventory before medications become outdated. When looking at expirations on medication vials, it is important to note that if a medication only mentions the month and year, but not the day, then you are to treat it as expiring at the end of the month. As an example, if a medication is marked as expiring on 02/2020, then you would treat it as expiring on February 29, 2020. The Occupational Safety and Health Administration (OSHA) requires all workplaces, including pharmacies, to carry material safety data sheets (MSDS) for all hazardous substances that are stored on the premises. This includes oncology drugs and volatile chemicals along with other hazardous chemicals. The MSDS provide handling, clean-up, and first-aid information. Segregating inventory by drug categories helps to prevent potentially harmful errors. The Joint Commission (TJC), formerly known as the Joint Commission on Accreditation of Healthcare Organizations (JCAHO), requires that internal and external medications must be stored separately. This reduces the potential that someone will dispense or administer an external product for internal use. The Joint Commission also has requirements for separate storage of oncology drugs and volatile or flammable substances. Hazardous drugs (e.g., oncology drugs) shall have a separate space on the shelves at or below eye level and should be labeled in such a way that it will alert staff of the hazardous potential of these medications. HDs in their final dosage form or unit of use may be interspersed with other medications on the shelves but still need to be adequately labeled. Oncology drugs are often cytotoxic themselves and must be handled with extreme care. They should be received in a sealed protective outer bag that restricts dissemination of the drug if the container leaks or is broken. Staff should wear personal protective equipment (PPE) when receiving and storing HDs. When an increased potential exists for exposure to hazardous drugs, all personnel involved must wear additional PPE while following a hazardous materials cleanup procedure. All exposed materials must be properly disposed of in hazardous waste containers. Volatile or flammable substances (including tax free alcohol) require careful storage. They must have a cool location that is properly ventilated. Their storage area must be designed to reduce fire and explosion potential. Head and hair (including beard and moustache, if applicable) and shoe covers shall be worn to reduce the possibility of particulate or microbial contamination in HD compounding areas. Hair, head, and shoe covers provide additional protection from contact with HD residue on surfaces and floors. Do not wear shoe covers outside the HD compounding areas to avoid spreading drug contamination to other areas and possibly exposing unprotected workers. eye and face protection Appropriate eye and face protection shall be worn when handling HDs outside an engineering control. A full-facepiece respirator also provides eye and face protection. Goggles shall be used when eye protection is needed; eye glasses alone or safety glasses with side shields do not provide adequate protection to the eyes from splashes. Use eye and face protection when manipulating an HD outside of a C-PEC (e.g., in the surgical suite), working at or above eye level, cleaning a C-PEC, or cleaning a spill. Use face shields in combination with goggles to provide a full range of protection against splashes to the face and eyes. Face shields alone do not provide full eye and face protection. respirator For most activities requiring respiratory protection, an NIOSH-certified N95 or more protective respirator is sufficient to protect against airborne particles; however, these respirators offer no protection against gases and vapors and little protection against direct liquid splashes (see CDC’s Respirator Trusted-Source Information at http://www.cdc.gov/niosh/npptl/topics/respirators/disp_part/RespSource3healthcare.html#e). Surgical masks do not provide respiratory protection from drug exposure and should not be used to compound or administer drugs. A surgical N95 respirator provides the respiratory protection of an N95 respirator and the splash protection provided by a surgical mask. gowns Disposable gowns that protect the worker from spills and splashes of HDs and waste materials and that have been tested to resist permeability by HDs shall be worn when handling HDs. Selection of gowns shall be based on the HDs used. Disposable gowns made of polyethylene-coated polypropylene or other laminate materials offer better protection than those of noncoated materials. Gowns shall close in the back (no open front), have long sleeves, and have closed cuffs that are elastic or knit. Gowns shall not have seams or closures that could allow drugs to pass through. Cloth laboratory coats, surgical scrubs, isolation gowns, or other absorbent materials are not appropriate outer wear when handling HDs, because they permit the permeation of HDs and can hold spilled drugs against the skin and increase exposure. gloves Gloves used shall be labeled as ASTM-tested chemotherapy gloves; this information is available on the box or from the manufacturer. Use powder-free gloves, because the powder can contaminate the work area and can adsorb and retain HDs. Inspect gloves for physical defects before use. Do not use gloves with pin-holes or weak spots. Wear two pairs of ASTM-tested chemotherapy gloves when compounding, administering, managing a spill, and disposing of HDs. For sterile preparations, the outer glove shall be sterile. Wear the inner glove under the gown cuff and the outer glove over the cuff. Place gloves with long cuffs over the cuff of the gown to protect the wrist and forearm. Workers may be exposed to a hazardous drug at any point during its manufacture, transport, distribution, receipt, storage, preparation, and administration, as well as during waste handling, and equipment maintenance and repair. All workers involved in these activities have the potential for contact with uncontained drug. In case of accidental exposure, you should consult the Material Safety Data Sheet (MSDS) which provide information on potential hazards associated with a particular material or product, safe handling procedures, proper clean-up, and first aid information. An eyewash is an appropriate device to utilize if hazardous or other unwanted materials come in contact with the eye. The individual exposed will probably be required to file an initial incident report (IIR) with their facility. Facilities that utilize hazardous drugs are required to have spill kits, which may be useful in the containment and cleanup of hazardous materials. Spill kits typically contain PPE, waste containers, warning signs to help minimize traffic through the contaminated area, powders for solidifying liquids, disposable scoops and brushes, absorbent gauze or pads, and a common deactivating agent such as sodium hypochlorite. Properly labeled, leak-proof, and spill-proof containers of non reactive plastic are required for areas where hazardous waste is generated, and can be further broken down into either yellow or black containers. Fully used vials, syringes, tubing, and bags of hazardous drug waste, along with PPE used while working with hazardous drugs, may be disposed in yellow, properly labeled containers. Also, any partially used or expired hazardous drugs that are not also considered to be RCRA (Resource Conservation and Recovery Act) regulated hazardous drugs should be placed in these yellow buckets. Trace contaminated items such as booties, gowns, and masks, even if they were not involved in spills, MUST be treated as hazardous waste (the yellow buckets are sufficient for this). Partially used bags, vials, syringes, etc. of RCRA listed hazardous pharmaceutical waste MUST be placed in black RCRA approved containers. Hazardous waste must be properly manifested and transported by a federally permitted hazardous waste transporter to a federally permitted hazardous waste storage, treatment, or disposal facility. A licensed contractor may be hired to manage the hazardous waste program. Some states, such as Hawaii and Montanna, currently do not allow e-prescribing of controlled substances. There are a number of medications with restrictions due to patient safety concerns. The FDA primarily manages these medications through their Risk Evaluation and Mitigation Strategy (REMS) initiative. The FDA may require manufacturers of drugs with safety concerns to submit a REMS program at the time a new drug is approved. These programs may contain any combination of 5 criteria (Medication Guide, Communication Plan, Elements to Assure Safe Use, Implementation System, and Timetable for Submission of Assessments). Restricted access programs are considered Elements to Assure Safe Use. A current list of medications with REMS programs can be found at http://www.fda.gov/Drugs/DrugSafety/PostmarketDrugSafetyInformationforPatientsandProviders/ucm111350.htm. Some of the medications with the most significant restrictions include thalidomide, clozapine, buprenorphine, and isotretinoin. These programs are intended to make sure that the patients are using the medications appropriately and to monitor them for undesirable side effects. Thalidomide was first developed in Germany as a sleep aid and shortly after entering the European market, the manufacturer decided it was also good for treating morning sickness. Unfortunately, the drug caused severe and life-threatening birth defects in 40% of infants. In 1998 thalidomide was approved for limited distribution in the United States for treating multiple myeloma. It is also used to treat erythema nodosum leprosum. Thalidomide is only available through the THALOMID REMS program. Prescribers must be certified with program, patients must comply with the strict guidelines of the program, and pharmacies must be certified with the program. Pharmacies must only dispense to patients that are authorized to receive the drug and comply with the requirements. Clozapine is an atypical antipsychotic medication used in the treatment of schizophrenia, and is also sometimes used off-label for the treatment of bipolar disorder. Clozapine carries many warnings, including warnings for agranulocytosis, CNS depression, leukopenia, neutropenia, seizure disorder, bone marrow suppression, dementia, hypotension, myocarditis, orthostatic hypotension (with or without syncope) and seizures. With these severe side effects in mind each of the manufacturers are required to enroll patients taking their medication into a national registry where they will monitor a patient's white blood cell count (WBC) and their absolute neutrophil count (ANC). If the numbers fall below a particular level their therapy may need to be halted and the national registry has a responsibility to report the information to the nonrechallengeable database, that way if a physician goes to place the patient on the medication again the various manufacturers will know they are not allowed as they always need to check new orders for a patient against the nonrechallengeable database. Once listed in the nonrechallengeable database they may never use clozapine again. The Drug Addiction Treatment Act of 2000 (DATA 2000) permits physicians who meet certain qualifications to treat opioid addiction with Schedule III, IV, and V narcotic medications that have been specifically approved by the Food and Drug Administration for that indication. Such medications may be prescribed and dispensed by waived physicians in treatment settings other than the traditional Opioid Treatment Program (methadone clinic) setting. Since there is only one narcotic medication approved by the FDA for the treatment of opioid addiction within the Schedules given, DATA 2000 basically refers to the use of buprenorphine for the treatment of opioid addiction. Methadone is a Schedule II narcotic approved for the same purpose within the highly regulated methadone clinic setting. Under the Act, physicians may apply for a waiver to prescribe buprenorphine for the treatment of opioid addiction or dependence. Requirements include a current State medical license, a valid DEA registration number, specialty or subspecialty certification in addiction from the American Board of Medical Specialties, American Society of Addiction Medicine, or American Osteopathic Association. Exceptions were also created for physicians who participated in the initial studies of buprenorphine and for State certification of addiction specialists. However, the Act is intended to bring the treatment of addiction back to the primary care provider. Thus most waivers are obtained after taking an 8 hour course from one of the five medical organizations designated in the Act and otherwise approved by the Secretary of the Department of Health and Human Services. When a physician qualifies for the waiver, he is given a second DEA number that begins with an 'X'. This new DEA number is only to be used when prescribing buprenorphine for the purpose of treating addictions. Once a physician obtains the waiver, he or she may treat up to 30 patients for narcotic addiction with buprenorphine. Recent changes to DATA 2000 have increased the patient limit to 100 for physicians that have had their waiver for a year or more and request the higher limit in writing. Isotretinoin is indicated for severe nodular acne unresponsive to conventional therapy in patients 12 years of age and older. Isotretinoin is a teratogen and is highly likely to cause birth defects if taken by women during pregnancy or even a short time before conception. A few of the more common birth defects this drug can cause are hearing and visual impairment, missing or malformed earlobes, facial dysmorphism, and mental retardation. Due to the teratogenicity of this product, isotretinoin is only available through a restricted program under REMS called iPLEDGE. Prescribers, patients, pharmacies, and distributors must enroll in the iPLEDGE program (https://www.ipledgeprogram.com). Phentermine and topiramate (available under the brand name Qsymia) is intended to be used in combination with calorie reduction and increased physical activity to assist in chronic weight management. The combination product of phentermine and topiramate is a teratogen and is highly likely to result in either cleft palate and/or cleft lip. Due to the teratogenic concerns associated with this product, women of childbearing age should take a pregnancy test prior to starting this therapy and they should consistently use effective contraception while taking this medication. Pharmacies must be certified by VIVUS (the manufacturer for Qsymia) to dispense the medication and as part of the mandatory REMS on this product pharmacies must handout the FDA approved Qsymia brochure that details concerns over the products teratogenicity and offers guidance on effective birth control options. While most federal laws provide the pharmacist with guidance on handling pharmaceuticals, the Omnibus Budget Reconciliation Act of 1990 (OBRA-90) placed expectations on the pharmacist in how to interact with the patient. While the primary goal of OBRA-90 was to save the federal government money by improving therapeutic outcomes, the method to achieve these savings was implemented by imposing on the pharmacist counseling obligations, prospective drug utilization review (ProDUR) requirements, and record-keeping mandates. OBRA-90 also required states to establish standards governing patient counseling. In particular, pharmacists must offer to discuss the unique drug therapy regimen of each Medicaid recipient when filling prescriptions for them. Such discussions must include matters that are significant in the professional judgment of the pharmacist. The information that a pharmacist may discuss with a patient is found in the enumerated list below. Name and description of the medication. Dosage form, dosage, route of administration, and duration of drug therapy. Special directions and precautions for preparation, administration, and use by the patient. Common severe side effects or adverse effects or interactions and therapeutic contraindications that may be encountered. Techniques for self-monitoring of drug therapy. Action to be taken in the event of a missed dose. Under OBRA-90, Medicaid pharmacy providers also must make reasonable efforts to obtain, record, and maintain certain information on Medicaid patients. This information, including pharmacist comments relevant to patient therapy, would be considered reasonable if an impartial observer could review the documentation and understand what has occurred in the past, including what the pharmacist told the patient, information discovered about the patient, and what the pharmacist thought of the patient's drug therapy. Information that would be included in documented information are listed below. Name, address, and telephone number. Known allergies and/or drug reactions. Comprehensive list of medications and relevant devices. Pharmacist's comments about the individual's drug therapy. While OBRA-90 was geared to ensure that Medicaid patients receive specific pharmaceutical care, the overall result of the legislation provided that the same type of care be rendered to all patients, not just Medicaid patients. The individual states did not establish 2 standards of pharmaceutical care-one for Medicaid patients and another for non-Medicaid patients. The end result is that all patients are under the same professional care umbrella requiring ProDUR, counseling, and documentation. The Health Insurance Portability and Accountability Act of 1996 (HIPAA) is the most significant piece of federal legislation to affect pharmacy practice since OBRA-90. The Privacy Rule component of HIPAA took effect on April 14, 2003, and was the first comprehensive federal regulation designed to safeguard the privacy of protected health information (PHI). Pharmacies that maintain patient information in electronic format or conduct financial and administrative transactions electronically, such as billing and fund transfers, must comply with HIPAA. While HIPAA places stringent requirements on pharmacies to adopt policies and procedures relating to the protection of patient PHI, the law also gives important rights to patients. These rights include the right to access their information, the right to seek details of the disclosure of information, and the right to view the pharmacy's policies and procedures regarding confidential information. The Health Insurance Portability and Accountability Act (HIPAA) imposes 5 key provisions upon pharmacies. The first provision is the requirement that each pharmacy take reasonable steps to limit the use of, disclosure of, and the requests for PHI. PHI is defined as individually identifiable health information transmitted or maintained in any form and via any medium. To be in compliance, a pharmacy must implement reasonable policies and procedures that limit how PHI is used, disclosed, and requested for certain purposes. The pharmacy also is obligated to post its entire notice of privacy practices at the facility in a clear and prominent location and on its Web site (if one exists). The second component of HIPAA requires that individuals be informed of the privacy practices of the pharmacy and that the pharmacy develop and distribute a notice with a clear explanation of these rights and practices. This notice must be given to every individual no later than the date of the first service provided, which usually means the first prescription dispensed to the patient. The pharmacist also is obligated to make a good-faith effort to obtain the patient's written acknowledgment of the receipt of the notice. Under the third component, pharmacies are required, as well, to select a compliance officer who will manage and ensure compliance with HIPAA. As part of the fourth component of HIPAA, all employees working in the pharmacy environment in which PHI is maintained must receive training on the regulations within a reasonable time after being hired. This training necessarily includes pharmacists, technicians, and any other individuals who assist in the pharmacy. Finally, in some situations, it is necessary for the pharmacy to allow disclosure of PHI to a person or organization that is known under HIPAA as a "business associate." Typically, business associates perform a function that requires disclosure of PHI such as billing services, claims processing, utilization review, or data analysis. Under HIPAA, a pharmacy is allowed to disclose PHI to a business associate if the pharmacy obtains satisfactory assurances, usually in the form of a contract, that the business associate will use the information only for the purposes for which it was engaged by the pharmacy. HIPAA also provides security provisions. These security provisions went into effect April 20, 2005, almost 2 years after the privacy provisions. The security standards are designed to protect the confidentiality of PHI that is threatened by the possibility of unauthorized access and interception during electronic transmission. Like the privacy provisions, any pharmacy that transmits any health information in electronic form is required to comply with the security rules. In particular, the security standards define administrative, physical, and technical safeguards that the pharmacist must consider in order to protect the confidentiality, integrity, and availability of PHI. A unique aspect of the security provisions is that they include both "required and addressable" implementation specifications. Required implementation specifications are those that must be met, whereas, in addressable specifications, the pharmacy must determine whether the suggested safeguards are reasonable and appropriate, given the size and capability of the organization as well as the risk. While cost may be a factor that a covered entity may consider in determining whether to implement a particular specification, nonetheless a clear requirement exists that adequate security measures be implemented. Cost considerations are not meant to exempt covered entities from this responsibility. The Health Information Technology for Economic and Clinical Health Act (HITECH Act) of 2009 provided additional privacy provisions and penalties to HIPAA when dealing with electronic protected health information (ePHI). Electronic protected health information is individually identifiable health information that is created, stored, transmitted, or received electronically. The portions that affect the HIPAA regulation on pharmacy the most are the breach reporting requirements and the financial penalties for data breaches. If a breach of ePHI occurs, the affected individuals must be notified. If the unsecured ePHI of more than 500 individuals is reasonably believed to have been, accessed, acquired, or disclosed during such a breach, the HITECH Act requires HIPAA covered entities to report this breach to Health and Human Services (HHS) and the media, in addition to notifying the affected individuals. The penalties outlined in the HITECH Act for violating the privacy provision range from $100 to $1,500,000 based on the type of disclosure, the root cause, and the number of individuals affected. Anyone that watches television, surfs the web, or flips through magazines and journals is very familiar with advertising for pharmaceuticals picturing attractive, healthy and active people. Prescriptions and over the counter medications are safely used by millions of consumers for various ailments, diseases and medical conditions everyday. While many great things have been accomplished by the development of so many medications and the marketing to millions of consumers, there are also serious side effects or other undesired results. In some cases, the U.S. Food and Drug Administration or manufacturer may recall or withdraw a specific batch or completely remove a medication from the market. Recalls are, with a few exceptions, voluntary on the part of the manufacturer. However, once the FDA requests a manufacturer recall a product, the pressure to do so is substantial. The negative publicity from not recalling would significantly damage a reputation, and the FDA could take the manufacturer to court where criminal penalties could be imposed. The FDA can also require recalls in certain instances with infant formulas, biological products, and devices that pose a serious health hazard. Manufacturers may of course recall drugs on their own and do so from time to time for any number of reasons. There are three drug recall classifications. Reasonable probability that the use of, or exposure to, a violative product will cause serious adverse health consequences or death. An example would include the diet aid Fen-Phen (fenfluramine/phentermine) which caused irreparable heart valve damage and pulmonary hypertension. Use of, or exposure to, a violative product may cause temporary or medically reversible adverse health consequences or where the probability of serious adverse health consequences is remote. An example would include a medication that is under-strength but that is not used to treat life-threatening situations. Use of, or exposure to, a violative product that is not likely to cause adverse health consequences. Examples might be a container defect (plastic material delaminating or a lid that does not seal), off-taste or incorrect color, and simple text errors such as the incorrect expiration date on the manufacturer's bottle. When an FDA-regulated product is either defective or potentially harmful, recalling that product, removing it from the market or correcting the problem is the most effective means for protecting the public. This is a multi-step process. A company discovers a problem and contacts the FDA. The FDA inspects a manufacturing facility and determines the potential for a recall. The FDA receives reports of health problems through various reporting systems. The Centers for Disease Control and Prevention (CDC) contacts the FDA. After receiving enough reports of adverse effects or misbranding it decides the product is a threat to the public health and it contacts the manufacturer to recommend a recall. Provided the manufacturer agrees to a recall, they must establis a recall strategy with the FDA that addresses the depth of the recall, the extent of the public warnings, and a means for checking the effectiveness of the recall. The depth of the recall is identified by wholesale, retail, or consumer levels. instructions on what to do with the, beginning with ceasing distribution. FDA recalls are listed in the FDA's weekly enforcement report ( http://www.fda.gov/Safety/Recalls/EnforcementReports/default.htm ), see recent recalls at http://www.fda.gov/Safety/Recalls/default.htm , and you can receive email alerts at https://public.govdelivery.com/accounts/USFDA/subscriber/new?topic_id=USFDA_48 . Many subscription services, such as Medscape and Drug Facts and Comparisons eAnswers, also include drug recall information. FDA evaluates whether all reasonable efforts have been made to remove or correct a product. A recall is considered complete after all of the company’s corrective actions are reviewed by FDA and deemed appropriate. After a recall is completed, FDA makes sure that the product is destroyed or suitably reconditioned, and investigates why the product was defective in the first place. To emphasize the importance of drug recalls let's look at what are commonly considered the 10 worst drug recalls in U.S. history. Financial damage: Over $21 billion (awards to victims are close to $14 billion), making it one of the most costly products liability cases in history. Fen-Phen’s was a ver popular anorectant. It is estimated that as many as 6.5 million people took it to help fight obesity. After consumers began experiencing rare heart valve deffects and pulmonary hypertension problems, the FDA set the recall in motion. American Lawyer reported that more than 50,000 Fen-Phen victims have filed suits against Fen-Phen’s maker Wyeth, and legal expenses combined with awards are believed to have exceeded $21 billion. Its 24 years in the marketplace combined with the severity of both the public reaction and the significant awards granted to its victims make its impact unprecedented. Financial damage: Unknown quantity of financial reparations in the billions, but difficult to fully quantify since each manufacturer paid out legal damages correlated with its respective market share (a new way of awarding damages in these cases). DES was prescribed for more than thirty years to prevent miscarriages and other complications during pregnancy. It was not until 1971 before it was connected to a rare tumor that kept appearing in the daughters of women who had taken it. The FDA only banned DES prescriptions to women because no such problems have been found in men. In fact, it can still be prescribed to men to treat estrogen deficiency. Litigation over DES led to a landmark products liability award that heavily influenced how both the courts and the FDA approach oversight of drugs with multiple manufacturers. Baycol (cerivastatin) is a synthetic member of the class of statins, used to lower cholesterol and prevent cardiovascular disease. It was withdrawn from the market in 2001 because of the high rate of serious side-effects. Cerivastatin was marketed by the pharmaceutical company Bayer A.G. in the late 1990s as a new synthetic statin, to compete with Pfizer's highly successful Lipitor (atorvastatin). During post-marketing surveillance, 52 deaths were reported in patients using cerivastatin, mainly from rhabdomyolysis and its resultant renal failure. Risks were higher in patients using fibrates (mainly gemfibrozil) and in patients using the high (0.8 mg/day) dose of cerivastatin. Another 385 nonfatal cases of rhabdomyolysis were reported. This put the risk of this (rare) complication at 5-10 times that of the other statins. Rofecoxib is a NSAID developed by Merck & Co. to treat osteoarthritis, acute pain conditions, and dysmenorrhoea. Rofecoxib was approved as safe and effective by the FDA on May 20, 1999 and was subsequently marketed under the brand name Vioxx. Rofecoxib gained widespread acceptance among physicians treating patients with arthritis and other conditions causing chronic or acute pain. Worldwide, over 80 million people were prescribed rofecoxib at some time. During the post-marketing phase the VIGOR and the APPROVe study both showed dramatic increases in myocardial infarctions. There is even evidence that the authors of an article for NEJM that promoted Vioxx had seen the disturbing results of VIGOR and withheld this information in the article. In addition to its own studies, on September 23, 2004 Merck received information about new research by the FDA that supported previous findings of increased risk of heart attack among rofecoxib users. FDA analysts estimated that Vioxx caused between 88,000 and 139,000 heart attacks, 30 to 40 percent of which were probably fatal, in the five years the drug was on the market. Merck publicly announced its voluntary withdrawal of the drug from the market worldwide on September 30, 2004. Valdecoxib is a non-steroidal anti-inflammatory drug (NSAID) used in the treatment of osteoarthritis, rheumatoid arthritis, and painful menstruation and menstrual symptoms. It is a cyclooxygenase-2 selective inhibitor. Valdecoxib was manufactured and marketed under the brand name Bextra by G. D. Searle & Company. It was approved by the United States Food and Drug Administration on November 20, 2001, and was available by prescription in tablet form until 2005, when it was removed from the market due to concerns about possible increased risk of heart attack and stroke. Financial damage: The manufacturer grossed $1.2 billion in sales prior to the recall. Rezulin (troglitazone) is an anti-diabetic (NIDDM) and antiinflammatory drug, and a member of the drug class of the thiazolidinediones. In the United States, it was introduced and manufactured by Parke-Davis in the late 1990s, but turned out to be associated with an idiosyncratic reaction leading to drug-induced hepatitis. One FDA medical officer evaluating troglitazone, John Gueriguian, did not recommend its approval due to potential high liver toxicity, but a full panel of experts approved it in January 1997. Once the prevalence of adverse liver effects became known, troglitazone was withdrawn from the U.S. market in 2000. Financial damage: Able Laboratories had $103 million in annual sales before recall. On May 27, 2005 the Food and Drug Administration notified consumers and healthcare professionals of a nationwide recall of all manufactured drugs (mostly generic prescription drugs, including drugs containing acetaminophen) from Able Laboratories of Cranbury, NJ, because of serious concerns that they were not produced according to quality assurance standards. Able Laboratories subsequently ceased all production. Inconsistencies in manufacturing by Able Laboratories resulted in both subpotent and superpotent medications. Financial damage: Seldane was a big moneymaker for Hoechst Marion Roussel for such a long period (the year before it was pulled it sold $440 million worth of Terfenadine worldwide). In addition to its legal expenses, the loss of market share alone to drugs such as Claritin (loratadine) was steep. Seldane (terfenadine) is an antihistamine formerly used for the treatment of allergic conditions. It was brought to market by Hoechst Marion Roussel (now Sanofi-Aventis). According to its manufacturer, terfenadine had been used by over 100 million patients worldwide as of 1990. It was superseded by fexofenadine in the 1990s due to the risk of cardiac arrhythmia caused by QT interval prolongation. Terfenadine is a prodrug, generally completely metabolized to the active form fexofenadine in the liver by the enzyme cytochrome P450 CYP3A4 isoform. Due to its near complete metabolism by the liver immediately after leaving the gut, terfenadine normally is not measurable in the plasma. Terfenadine itself, however, is cardiotoxic at higher doses, while its major active metabolite is not. Toxicity is possible after years of continued use with no previous problems as a result of an interaction with other medications such as erythromycin, or foods such as grapefruit. The addition of, or dosage change in, these CYP3A4 inhibitors makes it harder for the body to metabolize and remove terfenadine. In larger plasma concentrations, it may lead to toxic effects on the heart's rhythm (e.g. ventricular tachycardia and torsades de pointes). Phenylpropanolamine is an ingredient used in prescription and over-the-counter (OTC) drug products as a nasal decongestant to relieve stuffy nose or sinus congestion and in OTC weight control drug products to control appetite. On May 11, 2000, FDA received results of a study conducted by scientists at Yale University School of Medicine that showed an increased risk of hemorrhagic stroke (bleeding of the brain) in people who were taking phenylpropanolamine. Phenylpropanolamine has been used for many years and a very small number of people taking the drug have had strokes. The Yale study helped show that the number of people having strokes when taking phenylpropanolamine was greater than the number of people having strokes who were not taking phenylpropanolamine. Although the risk of hemorrhagic stroke is very low, FDA has significant concerns because of the seriousness of a stroke and the inability to predict who is at risk. Because of continued reports to the FDA of hemorrhagic stroke associated with phenylpropanolamine and the results of the Yale study, the FDA now feels that the risks of using phenylpropanolamine outweighs the benefits and recommends that consumers no longer use products containing phenylpropanolamine. Financial damage: Analysts had projected $2.9 billion in sales within 4 years. In only one year on the market, Posicor (mibefradil) was linked to 123 deaths. Considered relatively safe when taken alone, Posicor became potentially deadly when combined with any of 25 different drugs. The large number of deaths are troublesome considering that the drug was prescribed to no more than 200,000 people worldwide in the space of one year, a relatively small number. Posicor is on this list for stimulating debate surrounding policies encouraging the FDA to hasten the approval of certain drugs. It is often cited as a strong example of what can go wrong when drugs are rushed to market. Infection control is concerned with preventing nosocomial or healthcare-associated infections. It is an essential part of the infrastructure of healthcare. Infection control addresses factors related to the spread of infections within the healthcare setting (whether patient to patient, patients to staff, and staff to patient, or among staff), including prevention via hand hygiene, facility and equipment cleaning, and through the use of personal protective equipment (PPE). The Occupational Safety and Health Administration (OSHA) standards require that employers must provide readily accessible hand washing facilities, and must ensure that employees wash hands and any other skin with soap and water or flush mucous membranes with water as soon as feasible after contact with blood or other potentially infectious materials. "...personnel perform a thorough hand-cleansing procedure by removing debris from under fingernails using a nail cleaner under running warm water followed by vigorous hand and arm washing to the elbows for at least 30 seconds with either nonantimicrobial or antimicrobial soap and water." Equipment and facilities for both sterile and nonsterile require cleaning and inspection. "Equipment and accessories used in compounding are to be inspected, maintained, cleaned, and validated at appropriate intervals to ensure the accuracy and reliability of their performance." Since environmental contact is a common source of contamination with respect to compounded sterile preparations, USP 797 provides a series of standards related to buffer room/clean room, ante room/ante area, and equipment design and cleaning schedules for facilities and equipment used for assembling CSPs. Primary engineering controls (i.e., laminar airflow workbenches, biological safety cabinets, and barrier isolators) which are intimate to the exposure of critical sites, require disinfecting more frequently than do the actual room surfaces such as walls and ceilings. Cleaning and disinfecting primary engineering controls are the most critical practices before the preparation of CSPs. Such surfaces shall be cleaned and disinfected frequently, including at the beginning of each shift, prior to each batch preparation, every 30 minutes during continuous compounding periods of individual CSPs, when there are spills, and when surface contamination is known or suspected. With respect to the rooms involved in preparing CSPs, counters and easily cleanable work surfaces must be cleaned daily. Walls, ceilings, and storage shelving must be cleaned on a monthly basis. When assembling CSPs, preparers should don personal protective equipment (PPE) to further minimize the likelihood that they will contaminate the final product. USP 797 provides requirements for how personnel should wash and garb including the order that they should don their PPE, from dirtiest to cleanest. First, personnel should remove unnecessary outer garments and visible jewelry (scarves, rings, earrings, etc.). Next, they should don shoe covers, facial hair and hair covers, and masks (optionally they may include a face shield). Next, they must perform appropriate hand hygiene. After hand washing, a nonshedding gown with sleeves that fit snugly around the wrists should be put on. Once inside the buffer area an antiseptic hand cleansing using a waterless alcohol-based hand scrub should be performed. Sterile gloves are the last item donned prior to compounding. The first consideration is the health and safety of the patient. Honesty and integrity are integral to the high moral and ethical principles of this field. Pharmacy technicians are expected to assist pharmacists in providing patients with safe, efficacious, and cost effective access to health resources. Technicians and pharmacists should respect the values of each other's abilities as well as those of colleagues and other healthcare professionals. Technicians and pharmacists should maintain their competencies and seek to enhance their knowledge and skills. Healthcare professionals need to maintain a patient's rights to dignity and confidentiality. Pharmacy professionals may not assist in providing medications and medical devices of poor quality that do not meet the necessary standards established by laws. Pharmacy professionals are not to engage in activities that would discredit the profession. Pharmacy professionals should engage in and support organizations that promote their professions and the enhancements of those that are in the profession. Individual state boards of pharmacy (BOP) provide further standards for pharmacy personnel, including job responsibilities and requirements such as registration, licensure, and certification. Depending on the specific kind of pharmacy practice, various kinds of facilities, equipments, and supplies will be required. The needs of a hospital pharmacy are different from those of a community pharmacy, just as the needs of a nuclear pharmacy will be different from those of a mail order pharmacy. All facilities will have to be clean enough to meet any state and local sanitation requirements. Facilities will need to have adequate space to perform their necessary duties. In many states, their Board of Pharmacy (BOP) will establish minimum requirements for space. They will need a properly functioning heating, ventilation, and air-conditioning (HVAC) system to ensure that medications on the shelf are stored at controlled room temperature (15 to 30° C or 59 to 86° F). The facility will need properly maintained and monitored refrigerators (2 to 8° C or 36 to 46° F) and freezers (-25 to -10° C or -13 to 14° F) for medications that need to be stored that way. Facilities that assemble compounded sterile preparations (CSPs) will need a primary engineering control, such as a laminar airflow workbench, with adequate support systems around it (i.e., a buffer room). According to the United States Pharmacopeia (USP) chapter 797, if a facility prepares more than a low volume of hazardous drugs, it will need a dedicated negative pressure room. This low volume requirement will likely change whenever a proposed USP chapter 800 is completed and eventually enforced. All pharmacies will need ready access to drug information resources. Some BOPs will place very specific requirements on what kind of drug information resources pharmacies need to carry, whereas others may simply require an adequate reference library to meet the needs of the patient population they serve. It is extremely important that whatever drug references are being utilized in a pharmacy, that they are the most up-to-date editions available. This page was last modified on 2 March 2015, at 18:46. This page has been accessed 50,161 times.